TDOT announces a complete list of lane-closure activity due to construction or maintenance operation on state-owned roads within the 24 middle and east Tennessee counties of TDOT Region 2. CUMBERLAND COUNTY SR-101 (Peavine Road) Grading, drainage, and paving from Firetower Road to Westchester/Catoosa Boulevard: As grade work progresses, motorists should be alert for shifts in traffic patterns to allow for construction activities. Current activities include paving, utility relocation, grade work, storm drain, base stone, and curb and gutter. Temporary lane closures and traffic stoppages may be needed to support ongoing work. Lane closures will be needed at the Stonehenge Road intersection to allow for installation of a storm drain. Motorists should reduce speeds on Peavine Road and be alert for construction personnel/equipment entering and exiting the roadway. Estimated project completion date is November 2020. FENTRESS COUNTY SR-52 Resurfacing from east of the Obey River (LM 5.48) to west of SR-154 (LM 11.00): Paving operations are complete. Contractor will be on site intermittently to address punch list items as weather permits. Estimated project completion date is February 2019. OVERTON COUNTY SR-52 Grading, drainage, signals and paving from near Oakley-Allons Road (LM 6.58) to SR-111 (LM 10.23): Contractor is scheduled to be on site to continue work on punch list items. Estimated project completion date is February 2019. PUTNAM COUNTY I-40 (LM 10) Bridge repair on Rocky Point Road over I-40: Work on this project continues. Rocky Point Road bridge at LM 10.08 over I-40 will be closed due to bridge repairs and will re-open on 06/06/2019. A detour is in place to guide motorists around the bridge closure. Estimated project completion date is June 2019. PUTNAM COUNTY I-40 Interchange lighting at the junction of Mine Lick Creek Road (LM 15.56): The contractor is installing pole foundations and trenching conduit throughout the project. Motorists should expect temporary lane closures and traffic stoppages during this time. Estimated project completion date is April 2019. PUTNAM COUNTY Utility Work on SR-136 (N. Washington Ave.) both directions from LM 4.3 to LM 5.4: Between Freeze Street and Bradley Street, work will take place involving the replacement of water/sewer services and relocation of a fire hydrant. Signage, barrels, and cones will be present during this work from 01/17/19 to 03/30/19 from 9:00 AM to 3:00 PM. Motorists should use caution and be aware of flaggers. BLEDSOE COUNTY SR-101 Bridge repair over Bee Creek (LM 8.98): Work on this project is underway. For the safety of the traveling public, the bridge will be reduced to one 10 foot lane and controlled with temporary signals. Thursday, February 7th, from 8:30 AM CST through 1:00 PM CST the contractor will have intermittent road closures as they set beams for phase 1 of the bridge repair. RESTRICTIONS: 10 foot lane. Estimated project completion date is September 2019. FRANKLIN COUNTY SR-476 Bridge repair over the Elk River (LM 3.39) and Hurricane Creek (LM 7.40): The contractor will resume working on punch list Items on Thursday 02/07/19 and is anticipated to have the project complete by Friday 02/08/19. Intermittent lane closures may be used to allow the contractor to complete punch list items. Estimated project completion date is February 2019. FRANKLIN COUNTY Utility Work on SR-476 (Mansford Rd.) eastbound from LM 3.3 to LM 3.6: There will be a Westbound lane closure on the bridge over Tims Ford Lake for utility maintenance from 01/17/19 to 04/30/19 between 6:00 PM and 5:00 AM. Warning signs and flaggers will be present. Motorists should reduce speed, and be prepared to stop. MARION COUNTY Rock fall mitigation on I-24 westbound at MM 136.2: Progress work is underway at this time. During this reporting period the contractor will be working on drilling, scaling and blasting. Left shoulder, left lane (lane 1), and right shoulder are closed. Roadway is reduced to two lanes (lane 2 and 3) with a lane shift for the duration of project. Possible rolling road blocks should be expected with no longer than 20 Minute intervals to perform blasting operations. Estimated project completion date is May 2019. MARION COUNTY TDOT Maintenance on SR-2 (US-HWY. 41) both directions from LM 25.6: Slide repair work has route down to one lane with traffic signals controlling alternating directions. RESTRICTIONS: Any wide load greater than 12 feet or long load greater than 53 feet is restricted on this section of roadway. Estimated project completion date is June 2019. MARION COUNTY SR-156 over Running Water Creek (LM 25.58) Bridge rehabilitation: SR-156 is reduced to one 10 foot lane across Running Water Creek Bridge and is being controlled with a temporary traffic signal while the bridge is repaired. RESTRICTIONS: 10 foot lane. Estimated project completion date is October 2019. WARREN COUNTY SR-288 Construction of a concrete bulb-tee beam bridge over Collins River (LM 4.97), including grading, drainage and paving: The bridge is currently reduced to one 10.5-foot lane to allow the contractor to construct the new bridge. While the bridge is down to one lane, traffic will be maintained and controlled by a temporary signal for the safety of the traveling public. Motorists should expect periodic delays and use caution in the work zone. RESTRICTIONS: 10.5-foot max width. WARREN COUNTY SR-8 over Collins River (LM 8.14) Bridge Repair: The bridge is currently reduced to one 11-ft. lane to allow the contractor to repair the existing bridge. While the bridge is down to one lane, traffic will be maintained and controlled by a temporary signal for the safety of the traveling public. Motorists should expect periodic delays and use caution in the work zone. RESTRICTIONS: 11-ft max width. Estimated project completion date is August 2019. WARREN COUNTY Utility Work on SR-287 (GREAT FALLS RD.) both directions from LM 34.95 to LM 38.63: Beginning West near Warren County Park Road, amid utility work from east of Beach Road. Signs and flaggers to be used, work to be intermittent. From: 02/13/19-03/13/19 between: 9:00 AM and 3:00 PM. Estimated project completion date is March 2019. WARREN COUNTY Utility Work on SR-30 (Spencer Rd.) both directions from LM 2.87 to LM 5.28: From 01/23/19 to 03/23/19 between 9:00 AM and 3:00 PM, new aerial and buried fiber cable will be installed between Melvin Scott Road and Molly Road. Signs and flaggers will be used, and work will be intermittent. BRADLEY COUNTY TDOT Maintenance on SR-60 (GEORGETOWN RD. N.W.) both directions from Eureka Rd (LM 20) to Hamilton County Line (LM 25): Beginning on 01/02/19 and lasting through 02/28/19, TDOT crews will be performing maintenance on the ditches and pipes on State Route 60 (Georgetown Rd.) from Eureka Rd. (LM 19.94) to the Hamilton County Line (LM 25.06). This work will take place between 8:00 AM and 4:30 PM on weekdays and will require intermittent lane closures as the work progresses. Estimated project completion date is February 2019. BRADLEY COUNTY Utility Work on SR-2 (N. LEE HWY.) both directions from LM 13.10 to LM 13.10: To retire old service at 4675 N. Lee Hwy (Paul Huff Pkwy and Sequoia Rd. NW) Signs, cones, and flaggers will be used as needed. From: 01/31/19-02/28/19 between: 9:00 AM and 3:00 PM. Estimated project completion date is February 2019. BRADLEY COUNTY Utility Work on SR-312 (HARRISON PK.) westbound from LM 8.48 to LM 8.48: Retire obsolete fitting in the main intersection of Highway 312 and Highway 11, replace and add test station - Keith Street. Signs, cones, and flaggers will be used as needed. From 02/4/19-02/28/19 between: 9:00 AM and 2:00 PM. Estimated project completion date is February 2019. BRADLEY AND MCMINN COUNTY SR-312 (Bradley Co.) Misc. safety improvements from the Hamilton Co. Line (LM 0.00) to Quill Dr. (LM 5.27); US-11 (SR-2) (McMinn Co.) Misc. safety improvements from Sanford Rd. (LM 4.05) to Chapel Rd. (LM 12.32): Work on this project is underway. The contractor will work in McMinn County on US11 (SR2) during this report period. There will be intermittent lane closures. Flaggers will assist with traffic control. Estimated project completion date is June 2019. HAMILTON COUNTY I-75 at I-24 Interchange Reconstruction: Expect work beyond the shoulder throughout the project between 9:00 AM and 3:00 PM for surveying and unloading equipment. HAMILTON COUNTY US-27 (I-124) Widening from I-24/US-27 interchange to north of the Olgiati Bridge over the Tennessee River, including widening the Olgiati Bridge: Work on this project continues with activities occurring on the west side of southbound US-27. Motorists should be alert for construction vehicles entering and exiting the area along the access ramps for east and westbound M. L. King Boulevard. The speed limit for the access ramp is 35 MPH. The 12th Street tie-in ramp to US-27 South has been temporarily closed. This closure will be in place until further notice. Additionally, the southbound ramp from W. Main St.to southbound US-27 has been temporarily closed and will remain so until further notice. Detours are posted. Motorists should pay close attention to the detour signage posted. The speed limit on US-27 in the construction zone remains 45 MPH. Weather permitting; the contractor may implement temporary lane/shoulder closures on weeknights between the hours of 7:00 PM and 6:00 AM. At least one lane will remain open in each direction on US-27. Beginning Monday night 02/11/2019, a temporary road closure will be in place on Riverfront Pkwy. between Chestnut St. and West M. L. King Boulevard. The actual closure will be under the Olgiati Bridge/US-27 for 100'in each direction and all commercial and residential property access will be maintained. Detours will be posted using Chestnut St. and M. L. King Boulevard. This closure is for the removal of overhead construction equipment and is scheduled for Monday night 02/11/2019, Tuesday night 02/12/2019 and Wednesday night 02/13/2019, between the hours of 7:00 PM to 6:00 AM. RESTRICTIONS: I-124 (US-27)Northbound Exit 1C 4th St Off Ramp No oversize/over dimensional loads I-124 (US-27) Southbound Exit 1A-B Martin Luther King Blvd. Off Ramp No oversized/over dimensional loads I-124 (US-27) Southbound On Ramps from Martin Luther King Blvd. No oversized/over dimensional loads. Estimated project completion date is January 2020. HAMILTON COUNTY TDOT Maintenance on I-24 eastbound from MM 180 to MM 183: 02/07/19 from 9:00 AM to 3:00 PM, #1 lane closure for surveying. HAMILTON COUNTY TDOT Maintenance on SR-153 (STATE HWY. 153) northbound from LM 7.0 to LM 7.3: 02/12/19 - 02/14/19, #2 lane closed from 8:00 PM – 5:00 AM. HAMILTON COUNTY SR-153 Resurfacing from I-75 (LM 0.00) to Shallowford Road (LM 2.60), including bridge deck repair: Lane closure on SR-153 SB on Saturday 2/9/19 (9:00 AM to 4:00 PM) for bridge repair at the Friar Branch bridge. Estimated project completion date is February 2019. HAMILTON COUNTY SR-111 (LM 1.5) Replacement of a collapsed 42" corrugated metal pipe, including grading, drainage, and paving. : During this report period, the roadway will be restricted to one (1) lane in the both directions & the speed limit will be reduced. The contractor may have additional lane restrictions while performing repairs. Flaggers will assist with traffic control as needed. Estimated project completion date is April 2019. HAMILTON COUNTY SR-320 (East Brainerd Road) Grading, drainage, installation of signals, construction of seven retaining walls and paving from east of Graysville Road to east of Bel-Air Road: During this report period, the contractor will have intermittent lane closures between 9:00 AM - 2:00 PM. This work may affect either direction of East Brainerd Road or side streets from Graysville Road to Hamlet Drive. Flaggers will assist with traffic control as needed. Estimated project completion date is February 2019. HAMILTON COUNTY SR-58 Miscellaneous safety improvements at the intersection of SR-312 (Birchwood Pike) (LM 15.70): Contractor will be completing various safety improvements at the intersection of SR-58 & Birchwood Pike Monday thru Saturday between 5:00 AM and 6:00 PM. No southbound traffic restrictions will be allowed between 5:00 AM and 9:00 AM. No northbound traffic restrictions will be allowed between 3:00 PM and 6:00 PM. Flaggers will assist with traffic control as needed. Estimated project completion date is April 2019. HAMILTON COUNTY US-11/64 SR-2 (Brainerd Rd./Lee Hwy.) Resurfacing from east of Moore Road (LM 13.85) to east of Airport Road (LM 15.84): During this report period, the contractor may have intermittent lane restrictions while adjusting utility manhole covers & handicap ramps. This operation will take place Monday thru Friday, 9:00 AM to 3:00 PM. This work may affect either direction of SR-2 (Brainerd Road/Lee Highway) and between Moore Rd & Airport Rd. Flaggers will assist with traffic control as needed. Estimated project completion date is February 2019. HAMILTON COUNTY Utility Work on SR-2 (BROAD ST.) both directions from LM 6.23 to LM 6.20: To retire old service at 3210 Broad Street between West 33rd Street & Watson. Street signs, cones, and flaggers will be used as needed. From: 01/31/19-02/28/19 between: 9:00 AM and 3:00 PM. Estimated project completion date is February 2019. HAMILTON COUNTY Utility Work on SR-8 (E. MAIN ST.) westbound from LM 6.20 to LM 6.20: Install 86' x 125 PLS service line within the ROW and bore under SR-8 to extend facilities to 2106 East Main Street. Signs, cones, and flaggers will be used. From: 01/31/19-02/28/19 between: 9:00 AM and 3:00 PM. Estimated project completion date is February 2019. HAMILTON COUNTY Utility Work on SR-8 (RINGGOLD RD.) both directions from LM 3.17 to LM 3.17: 1.25" gas service line to 4209 Ringgold Road between Dover Lane & Marlboro Avenue. Signs, cones, and flaggers will be used as needed. From: 01/31/19-02/28/19 between: 9:00 AM and 3:00 PM. Estimated project completion date is February 2019. MCMINN COUNTY SR-30, Grading, drainage and paving on SR-30 from Jackson Street to east of Knight Road in Athens: All traffic has been shifted into its phase two configuration. This will involve traffic using the newly built east bound portion of SR-30. Traffic will be restricted to one lane in each direction with turning lanes provided at critical intersections and business access. Estimated project completion date is October 2019. POLK COUNTY SR-40 (US-64) in the Ocoee River Gorge from LM 9.8 to SR-30 pipe replacement: Starting 01/18/19 and lasting through the middle of March, eleven pipes will be replaced. A flagging operation will maintain one lane of traffic. Motorists should expect delays for up to 15 minutes. Message boards have been deployed to give motorists advanced warning. Estimated project completion date is March 2019. POLK COUNTY US-64 (SR-40) Construction of a concrete bulb-tee beam bridge over Branch and TOHA Old Line railroad (LM 24.85), including grading, drainage and paving: The contractor has shifted traffic onto the new bridge. There will be intermittent lane closures as the contractor works to finish up on the project. Estimated project completion date is May 2019. POLK COUNTY US-64 (SR-40) Survey work from MM 10 to MM 15: Survey work Monday through Thursday 9:00 AM to 3:00 PM weather permitting. Expect intermittent flagging operations. Estimated project completion date is March 2019. REGION 2 TDOT Maintenance drainage work: There will be possible short-term lane and shoulder closures at various locations in Region 2 in order to clean rock and debris from ditches on an as-needed basis. One lane will be maintained at all times. REGION 2 TDOT Maintenance pothole repair and pavement patching: There will be possible short-term emergency lane closures at various locations in Region 2 in order to repair potholes and patch pavement on an as-needed basis. Depending on location and severity these repairs may be done during the day or at night. In addition to performing the work, regional Operations crews will also provide traffic control. REGION 2 On-call guardrail repair and new guardrail installation on various interstate and state routes: The contractor may have short term shoulder and/or lane closures in order to perform guardrail repair. These closures will take place on the interstate nightly from 7:00 PM to 6:00 AM Sundays through Thursdays and daily on State Routes. At least one travel lane will remain open to traffic at all times on the Interstate, and flaggers will be present on State Routes during any work that is performed. Estimated project completion date is June 2019. REGION 2 Preventative and unscheduled maintenance of Chattanooga SmartWay Intelligent Transportation System: The contractor may have short term shoulder and/or lane closures in order to perform preventative or unscheduled maintenance to the local SmartWay Intelligent Transportation System. Work hours are 9:00 AM to 3:30PM. At least one travel lane will remain open to traffic at all times. Flaggers will assist with traffic control as needed. Estimated project completion date is October 2019. 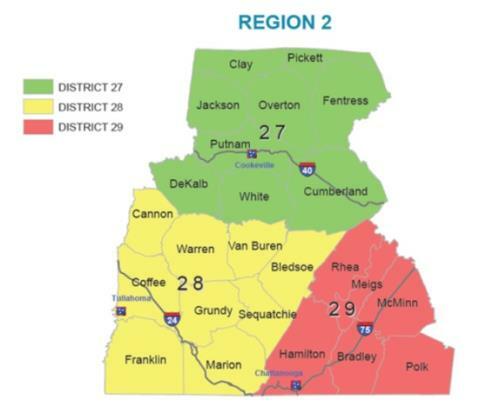 REGION 2 Sweeping and drain cleaning on various interstate and state routes: There will be mobile lane closures supporting a sweeping operation along regional interstates and highways through this reporting period. The sweeping activity will happen Sunday - Thursday (8:00 PM – 6:00 AM). Estimated project completion date is February 2019. REGION 2 On-call cable barrier repair on various interstate and state routes: The contractor may have short term shoulder closures in order to perform cable rail repair. Both travel lanes will remain open to traffic at all times on the Interstate during any work that is performed. Estimated project completion date is December 2019. REGION 2 On-call concrete pavement repair: During the week the contractor will be working on I-24 EB Exit 174 off and on ramps. Half of the ramp width will be closed leaving the remaining half open to traffic. These repairs expect to be completed by Friday, February 8, 2019. Estimated project completion date is March 2019. REGION 2 On-call signing: The contractor will be working on various state and interstate routes in across the region replacing and updating existing signs. The work will require only a shoulder closure to complete the work. Estimated project completion date is June 2019. MARION COUNTY - MAINT: Any wide load greater than 12 feet or long load greater than 53 feet is restricted on this section of roadway. WARREN COUNTY - CNS254: 11-ft max width. Motorists are encouraged to use caution and obey reduced speed limits in all TDOT work zones, regardless of lane closure activity. Information in this report is provided to the Department of Transportation by the contractors. Most work is weather dependent and subject to change due to inclement weather. All times are local. From your desktop or mobile device, get the latest construction activity and live streaming SmartWay traffic cameras at www.TNSmartWay.com/Traffic. Travelers can also dial 511 from any land-line or cellular phone for travel information, or follow us on Twitter at www.twitter.com/TN511 for statewide travel or Chattanooga area alerts @Chattanooga511 or any of TDOT's other Twitter pages. As always, drivers are reminded to use all motorist information tools wisely and Know Before You Go! by checking travel conditions before leaving for your destination. Drivers should never tweet, text, or talk on a cell phone while behind the wheel. In 2016, the Tennessee Department of Transportation lost three workers in the line of duty. All three were struck by passing motorists. Those tragedies bring the total number of TDOT lives lost to 112. We don't want to lose another member of our TDOT family. We're asking you to WORK WITH US. To learn more, go to the website at https://www.tn.gov/tdot/work-with-us/.